Everybody does it, so let’s talk about it. Poop. We’ve all heard the saying that the eyes are the windows to the soul. Well, your poop is the window to your digestive health! It may seem silly, but it’s true. How often are you pooping? Are you looking at it? It’s the best way to tell if you’re healthy or not. Everyone should be pooping at least once a day. It’s surprising the number of people who don’t. There are so many benefits to keeping the bowels moving regularly, such as reducing bloating, increasing energy and improving mood. It even clears up skin! If those things sound beneficial to you, let’s get down to business. One of the best infographics on this subject is the Bristol Poop Chart. Check it out and see what image most closely resembles your poop. 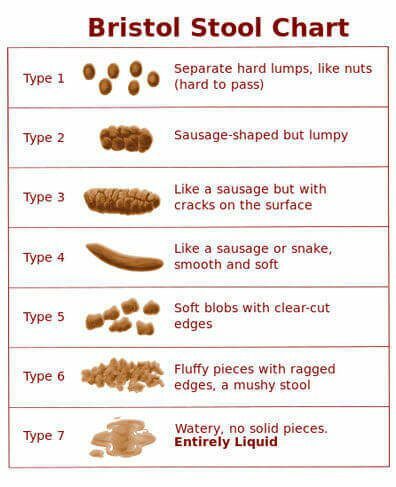 The chart displays seven types of poop on a scale of very dry to very wet. It has visual descriptions but doesn’t have any further explanation as to why the poop is looking the way it does. Type 1: Looks like little balls that are hard to pass. Type 2: Looks like sausage. A lumpy stool similar to type 1 but the balls are all stuck together. Usually is old poop that has been stuck in your gut for a while – not good! Type 3: Looks like sausage with cracks. Type 4: Looks smooth, C or S-like shape. Type 5: Looks like little blobs with clear-cut edges. Type 6: Looks mushy, fluffy with ragged edges. Type 7: Diarrhea, all liquid. In addition to the shape and consistency of your poop, there are other characteristics to be aware of too, such as the color. If you see a black stool that usually means you’re seeing old blood, possibly from an ulcer. A red stool is blood that’s fresher, possibly from a hemorrhoid. If you are seeing partially digested food or a greasiness in the toilet bowl, that’s a sign that your gut is having trouble digesting something. The digestive system needs enzymes to break down all of the food we eat. Some of us don’t produce enough of the enzymes on our own so not everything is getting digested. That means our bodies could be missing out on vital nutrients! It’s important to know what to look out for and how to correct the issue before it has a lasting impact on your health. If poop is floating and there’s a greasy sheen – you need a digestive enzyme with lipase. If you see leaves of veggies – you need a digestive enzyme with cellulase or you need to work on pre and probiotics to help digest these veggies. If you see chunks of meat – you need a digestive enzyme with a bromelain base or pepsin. In some cases, food can be sitting too long in the gut because the body is having a hard time digesting it. One example when this can happen is in a GMO food. The seeds have been genetically modified to withstand pesticides such as the weed-killer Roundup plus seeds are naturally created with proteins such as lectins that protect them from predators.. The food’s durability is so strong that our bodies can’t digest the food and it’s sitting in the gut for too long, irritating it. When the digestive system is irritated it slows down, leaving you feeling backed up and in an off-mood. Another common issue with the digestive lining is leaky gut. Leaky gut is when the digestive lining is so irritated that the tissue rips and food molecules get into the bloodstream. Those food molecules aren’t supposed to be there, so the body’s immune system tries to fight them! If your gut is irritated, any chemicals, dyes, and preservatives that you ingest with your food could be passing through leaky gut into the blood. Another reason it’s so important to watch what you eat – the immune system function lowers as it fights off the foreign invaders. Here are the top 8 habits to get pooping every day! – Eat closest to nature – ditch processed foods! – Food dyes – red, yellow etc. One of the best ways to feel your best is by getting your bowels moving regularly. The digestive system is linked with our immune system, brain, mood, hormones, virtually every part of the body! Hopefully your poop is falling in the middle of the Bristol Poop Chart and there are no unusual characteristics. If there are, it’s a sign there’s something off with your digestive health. Fix your gut and you’ll be surprised at the difference it makes every day. Follow these tips and you’ll be a pro pooper in no time! This blog is a summary of a podcast on this same topic. Click here to listen to the podcast!